The new Innova Aero will provide new and unique ownership experience to customers who go for a trendy and sporty look. Only 1,200 exclusive units of the Innova Aero will be on sale till December, 2012 which is based on the current GX version. 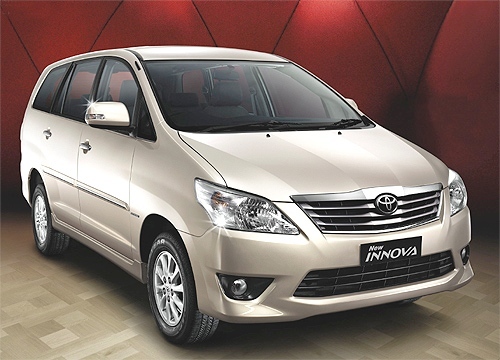 The New Innova Aero is available in options of a seven seater and an eight seater. In order to attract a large number of buyers, the company has offered two exclusive colour options with its new model, namely Super White and Silver Mica Metallic. The Innova Aero is available in Euro III and Euro IV. The Aero kit specially designed for the limited edition, enhances the overall appearance of the vehicle, giving it a refreshed look. The new Innova Aero is priced between Rs 12,25,677 and Rs 12,30,207 ex-showroom Delhi and will be available at all Toyota dealerships from today. Dual Tone Front Bumper Spoiler – The race inspired bumper spoiler gives a sporty look to the limited edition Innova Aero. Dual Tone Rear Bumper Spoiler – Beyond its sporty look, the striking Rear Bumper Spoiler gives a trendy appeal to the rear. Side Skirt – Designed to match the side mould, the sleek side skirt ensures an exclusive look. Roof Spoiler – With its sleek design and inevitable appeal, the Roof Spoiler enhances the dynamic look. Aero Emblem – The stylish emblem gives the limited edition Innova Aero a distinct identity. 0 Response to "Toyota introduces new Limited Edition model Innova Aero"